I have been looking forward to the release of this book since I first heard about it! 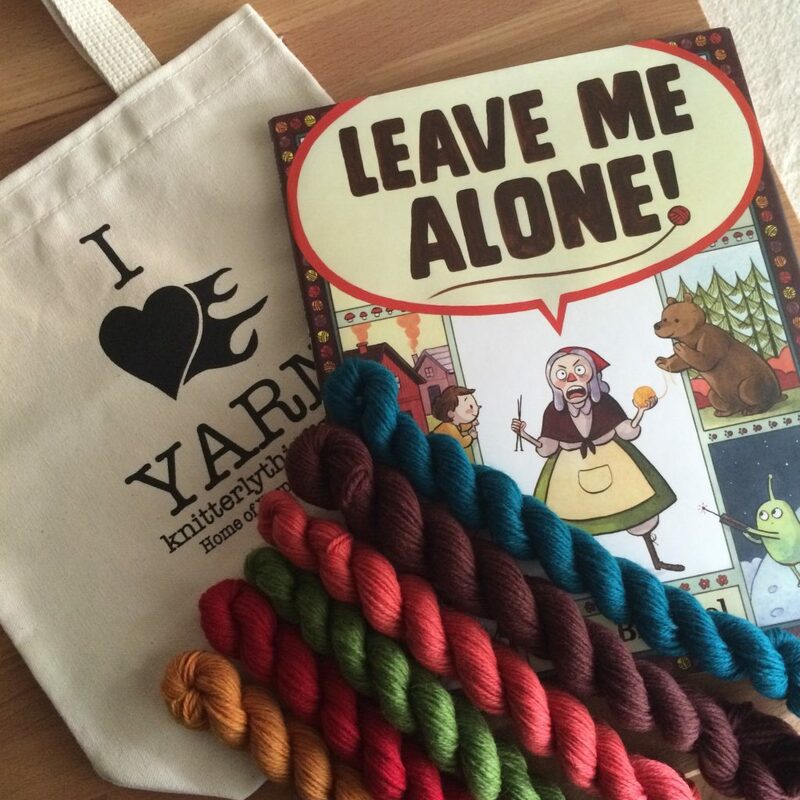 Being a Knitter in a Knitter’s world, I have been acquainted with Vera Brosgal (find her on IG here!) and her work and knitting for years (remember when Flickr was the place to be?? Yeah. ). Her book, about a Granny Knitter just wanting to be left alone to her knitting, was released this past Tuesday, and it is gorgeous! The Illustrations! The Color Palette! The Story! There is nothing not to love. I thought I’d share my excitement with all of you, and GIVE AWAY a copy! The winner will also receive a Knitterly Things ‘I Heart Yarn’ bag, AND a special edition Mitten Yarn Kit, with one copy each of our Chevron Love Mittens, and Super Simple Stripey Mittens patterns. To enter, leave a comment on this post telling me your favorite place/most ideal setting to work on your knitting. One comment per person, please. Winner will be drawn by random number generator sometime this Sunday. Thanks for playing, and good luck! 118 Responses to ‘Leave Me Alone!’ Giveaway! On the balcony of the house my Dad built, overlooking Lake Michigan. I do take my knitting a lot of places but my favorite place is probably simply on my sofa while binging on my favorite series on netflix or hulu! I like to settle in my recliner in the living room with the TV on. Doesn’t matter if I watch or not. At the beach! Or in a comfy chair with a cup of hot tea the other ten months of the year. Anywhere. Everywhere. But especially at home in the peace and quiet of my den, while also watching tv and reading (yay for multitasking). I love knitting in our sunroom while the kids play around me! Somewhere comfy with a lot of pillows. Mu favourite place to knit is at home in the sunniest spot in the house! My favorite place to knit is at my fav coffee house with friends! I used to go to a knitting store that had a coffee shop in back and overlooked a lake. I moved from that city 5 years ago, and think the shop closed, but I still pine for it. My “usual” spot is a giant cushy recliner in my living room, with Netflix on the HD television. But my favorite place is on a charter bus, on the way to or from a Science Olympiad tournament with my super-competitive middle school teams. While I chat with other coaches, talking strategy or just chit-chatting, I crank out pair after pair of socks for myself, for my kids, and for gifting. On our deck, under the sun umbrella! Al my gorgeous new house in the country! I have a project with me at all times but my fav is def the couch while watching tv or hanging with family!